Can Amazon change its predatory ways? 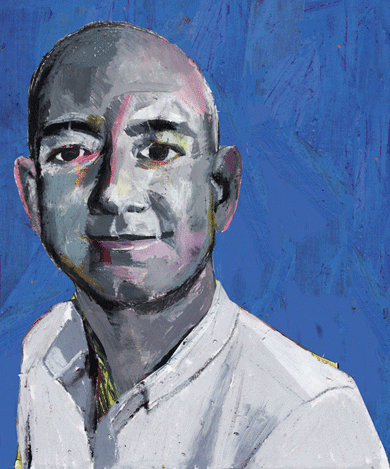 The Everything Store: Jeff Bezos and the Age of Amazon, by Brad Stone. Little, Brown. 392 pages. $28. “A shilling life will give you all the facts,” wrote W. H. Auden, tipping his hat to the biographer’s art while lamenting its utter inadequacy. Jeff Bezos, whose total conquest of e-commerce has made him one of the most famous people on the planet, has until now evaded any serious biographer. There have been shilling lives in the strictest sense, from the cut-and-paste job of Richard L. Brandt’s One Click: Jeff Bezos and the Rise of Amazon.com to the YA hagiography of Josepha Sherman’s Jeff Bezos: King of Amazon.com (“From the time he was a toddler, Bezos was busy trying to change his world. He felt he was too old to sleep in a ‘baby’ crib, so he found a screwdriver and took the crib apart!”). But Bezos has tightly controlled the flow of information about himself and his company. What readers have encountered is the same small fund of recycled anecdotes, most of them focusing on his childhood (brilliant nerd, inveterate tinkerer, ardent Trekkie) and the creation myth of Amazon itself, complete with the now obligatory reference to the role played by the founder’s suburban garage. Now, nearly twenty years after Bezos sold his first book online — for the record, it was Douglas Hofstadter’s appropriately brilliant and nerdy consideration of artificial intelligence Fluid Concepts and Creative Analogies — a skilled, stubborn biographer has finally caught up with him. Brad Stone, a longtime technology reporter for Bloomberg Businessweek, has done some truly archaeological digging for The Everything Store: Jeff Bezos and the Age of Amazon. While his closed-mouth subject declined to be interviewed for the book, Bezos did allow Stone to speak with friends, family members, corporate viceroys, and former employees (members of the last group have traditionally been muzzled not only by nondisclosure agreements but also by a lasting fear of offending their ex-padrone). At Amazon (where I worked from 1996 to 2001), there was hardly any distinction between Bezos and his creation. “In a way,” Stone writes, “the entire company is scaffolding built around his brain — an amplification machine meant to disseminate his ingenuity and drive across the greatest possible radius.” This suggests a megaphone, a lighthouse, maybe an antipersonnel mine of some sort. In any case, Stone delivers a thorough account of Amazon’s infancy, rude adolescence, and compulsively disruptive maturity — although Bezos would insist that the company is still in its early phase, what he likes to call Day One. James Marcus is executive editor of Harper’s Magazine. His next book, Glad to the Brink of Fear: A Portrait of Emerson in Eighteen Installments, will be published in 2015.